At a time when the maritime industry is increasingly being noted as the key to the growth of the SA economy, MUT gets ready to launch a new maritime course within the Engineering Faculty. 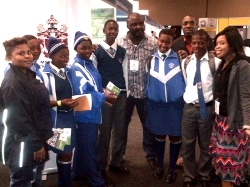 With these developments underway, it was fitting that Stakeholder Relations Officers (SRO’s), Nompilo Dlamini and Bongeka Gumede, accompanied by lecturers from Engineering, Onyeka Nkwonta and Adesoji Jaiyola, attend the SA maritime industry careers expo and job summit, in order to get the word out about MUT’s upcoming marine engineering course. Bongeka Gumede, SRO-Alumni Affairs said that she was excited to meet MUT graduates from the engineering faculty who had branched into the maritime sector. “This shows that the introduction of maritime studies at MUT is a step in the right direction,” she said.